Here at Pallen’s Martial Arts, San Leandro we provide a unique and stimulating program for our adults. Our style is a mix of traditional and contemporary martial arts that offers not only an effective self -defense program, but a means for personal development and discipline that can lead to success in other areas of your life. From our sweat dripping conditioning drills, to our self-paced martial arts training, our instructors provide one of the best and most enjoyable classes for both men and women. Also, for many parents who have enrolled their children in the martial arts, can find a lovely new way to connect with their child. Parents who partake in the martial arts at the same time as their children will find much higher satisfaction in their relationship as well as share a unique bond between a parent and child. We have also found that children that have parents in the martial arts are happier, retain the information better, and are more confident in themselves than those whose parents don’t take classes. ​On top of our numerous benefits to our adult program, by joining our class you join a large community of martial artist who train under the Pallen name. Many adults love our program, and you will too! We hope to see you training soon. Today women are looking for fitness programs that are exciting and different. Repeating the same exercise in the gym everyday can becoming boring and are rarely goal oriented. 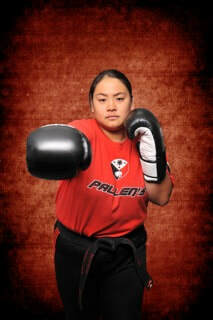 At Pallens Martial Arts women are finding that the classes are exciting, fun and goal oriented. They love the workout while at the same time learning valuable self-defense and survival skills. Women attending classes find they improve balance, flexibility, and cardiovascular fitness while building coordination and self-confidence. Martial arts, also, helps reduce daily stress. Our goal is to create an environment that gives everybody the opportunity to pursue and achieve a greater level of personal success and freedom. See for yourself why so many women are now studying martial arts. Adults train twice a week for an hour on Monday and Wednesday @ 8:00pm.